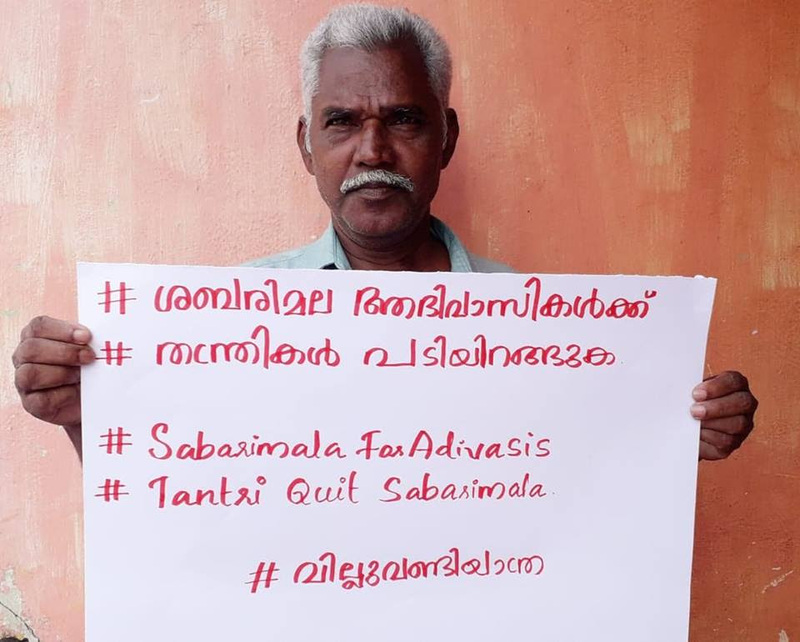 Ten Adivasi organizations, even as insisting that Sabarimala has been an Adivasi place of worship, have said that as per the Forest Rights Act (FRA), Adivasis have the community rights for their places of worship, adding, "The control of the Brahminical priests on Sabarimala has violated these rights of the Adivasis." Taking the controversy on the Kerala temple to a qualitatively new level, these organizations -- National Adivasi Andolana, Rajya Moola Adivasi Vedike, Budakattu Krishikara Sangha Kodagu, Budakattu Krishikara Sangha Mysore, Budakkatu Krishikara Sangha Periyapatna Taluk Mysore, Budakattu Krishikara Sangha Chickmagalore, Rajya Soliga Abhivruddi Sangha, Hassan Jilla Adivasi Hasalara Sangha, Iruliga Kshemabhivruddi Sangha and Bettakurubara Paramparika Sangha -- have demanded that Sabarimala Temple be returned to the Adivasis. We the following Adivasi organisations hereby express our deep concern on the recent developments and controversies about the Sabarimala temple in Kerala. The social, political and economic interests of the upper caste communities on Sabarimala Temple are well noticed by us.We hereby wish to express our need to retain our following rights that have been denied for generations. Many Adivasi spiritual places have been colonized by the upper castes replacing Adivasi spiritual leaders by Brahminical priests all over India. Sabarimala is only one such case. We demand that the ownership of such spiritual places of worship be returned to the Adivasis. As per the Forest Rights Act, Adivasis have the community rights for their places of worship. The control of the Brahminical priests on Sabarimala has violated these rights of the Adivasis. We demand that Sabarimala Temple be returned to the Adivasis. Historically, Sabarimala has been an Adivasi place of worship. It was only in the year 1902 that the Brahmin Tantris took control of this place of worship. Before that, as per the historical records, Adivasi priests were conducting the spiritual affairs in Sabarimala. We would like to bring to your notice that if anybody talks about the tradition of Sabarimala, the real tradition of Adivasis should be addressed. The tradition cannot be addressed from the date of colonising Sabarimala by the Brahminical forces. As per the Adivasi traditions, we do not say that no woman can enter our places of worship. Not just women, people from all faiths and religions have also been allowed to express their worship to our Gods. Our Gods are not owned by any secluded sections with their own selfish economic, social and political interests. As far as gender equality is concerned, we are far superior to the mainstream caste ridden, middle class societies. We hereby support the demands of women in Kerala to enter Sabarimala temple. We appeal to all sections of the civil society to see to it that narrow and selfish political gains in the name of God by the Sang Parivar forces and the soft Sangh Parivar forces be isolated. Our Gods have been colonised by the mainstream for centuries. Now, we do not wish that the mainstream society create communal rifts and violence in the name of our Gods. Spirituality is a right of every human being as per our tradition. Nobody should be restricted from his or her right to spirituality. We condemn all those interests who use our spirituality in its distorted form and then create communal tensions in the society. We are the children of forests. Sabarimala Forests are already getting weakened. Forests create rivers. Pampa river created by the Western Ghats is already polluted. Forests and rivers should not be destroyed in the name of Gods. The Adivasis have not done such destructive actions. Today, the present controllers of Sabarimala temple must take this responsibility on their shoulders. Forests and rivers are sources of life for Adivasis. The sources of life provided by our Gods cannot be destroyed by the mainstream interests. We appeal to the Kerala State Government to undertake urgent measures to solve this burning problem. We appeal to all those who believe in justice to support our call for the preservation of humanity, gender justice, protection of environment and equality of human beings without upper caste control. Brahmins give up ANY temple?!? !